Although the @Calvin_Hobbes feed is a perennial Twitter favorite of mine, I never expected it to furnish me with a nearly perfect illustration of the Regulative Principle of Worship. The RPW is the critical Reformed approach to worship which teaches that the only acceptable worship of God is the worship which God has commanded in his Word. We do not have liberty to invent new and novel ways of worshiping God and then import them into the church. To do so would be to both offer “strange fire” which God has never commanded, and also to bind the consciences of believers to “the doctrines and commandments of men” (see Leviticus 10:1, Matthew 15:9). The simplified way that I’ve rendered this principle is that the church must worship God in all the ways and only the ways he has commanded in his Word. Those who do not utilize the RPW will often respond to questions about a particular practice in the worship of the church with the “show me where it says I can’t” rejoinder. They demand a Biblical text explicitly stating that their latest innovation is banned. However, the approach of the Christian holding to the RPW is the exact opposite. He does not import his own ideas into the Scripture and force an unnatural test upon God’s Word. Rather, he takes the Biblical text as his starting point and searches out all the positive commands regarding the worship of God which may be found there. It is these commanded elements, exclusively, and in total, which constitute worship acceptable to God. All of which brings us to Calvin and Hobbes. Note well panel six in the comic strip below. Here we see a nearly perfect illustration of Hobbs insisting on adherence to the RPW, while Calvin adopts the opposite approach that if it isn’t forbidden, it’s permitted. As it is in Monopoly, so too it often is in the Church devoid of the Regulative Principle of Worship. Well the comic strip is a bit more at my level, you know? 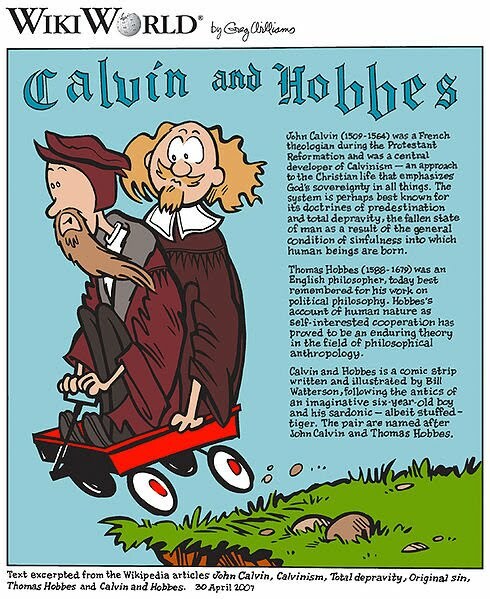 Interestingly, if you read the scenes in the wagon or sled when Calvin and Hobbes often discuss existential elements of life, Watterson patterns their comments after the views John Calvin and Thomas Hobbes respectively. Best comic strip ever.